Known in Hebrew as Yerushalayim and in Arabic as al-Quds, Jerusalem’s multi-religious landscape includes the sacred sites of the three major Abrahamic religions–Judaism, Christianity, and Islam. But attempts to claim exclusive right to the city have resulted in generations of conflict. In order to resolve these disputes, the Ottoman sultans instituted a series of agreements beginning in 1622 to preserve the status quo in Jerusalem, the latest of which was decreed by Sultan Abdulmecid I in 1852. The terms of the Status Quo remain in place today and guarantee all faiths access to their holy sites. 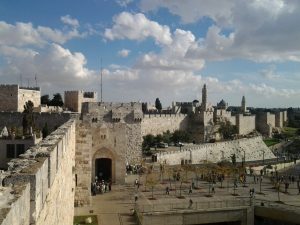 Within the past year, however, increased security measures at al-Aqsa mosque, a legal dispute involving Greek Orthodox properties at Jaffa Gate, and changes in Israeli municipal tax law have raised concerns about the viability of the Status Quo going forward. CMEP advocates policies that respect the religious liberty of all peoples and urges Israeli and Palestinian leaders to ensure the access of Jews, Muslims, and Christians to their holy sites in Jerusalem. Jerusalem is also the city of two peoples. Both Israelis and Palestinians rightfully regard Jerusalem as central to their national identities. For this reason the 1948 United Nations partition plan set aside Jerusalem to be an international city. However, following the 1948 Arab-Israeli War, the city was divided between Israel and Jordan. The historic Old City–home to the Temple Mount, the Noble Sanctuary, and the Church of the Holy Sepulchre–lay within Jordanian East Jerusalem. The 1967 War saw Israeli forces capture East Jerusalem along with the West Bank, Gaza Strip, Golan Heights, and Sinai Peninsula. In 1980, the government of Israel officially annexed East Jerusalem, a decision that the international community, until President Trump’s December 2017 announcement, has not recognized. During the Oslo Peace Process, Jerusalem was reaffirmed as a “Final Status Issue,” owing to its particularly contentious nature. CMEP believes that the status of Jerusalem must be resolved as part of a comprehensive peace agreement between Israelis and Palestinians and would support the recognition of the Holy City as the capital of both Israeli and Palestinian states. Join CMEP’s Executive Director Rev. Dr. Mae Elise Cannon as she interviews three special guests throughout February about the numerous issues related to President Trump’s decision to recognize Jerusalem as Israel’s capital.Three Middle East experts will discuss current realities on the ground in Israel, East Jerusalem, the West Bank, Gaza and the broader area; geopolitical perspectives inherent to the American administration’s recognition of Jerusalem and plan to move the Embassy; and challenges to the peace process that have arisen from their decision. More info available here. This interactive atlas of Jerusalem allows you to explore historic sites in the Old City, learn about the growth of Jerusalem over the centuries, and investigate how settlements and the separation barrier have changed the character of the city. A general introduction to Jerusalem’s sacred landscape, highlighting the significance of the Western Wall, Temple Mount, Noble Sanctuary, and Church of the Holy Sepulcre. Jerusalem is one of many sites under consideration for World Heritage Site status by the UNESCO. Proponents note the city’s importance as a place of interchange of human values; its unique testimony to a cultural tradition; and its association with living traditions, ideas, or beliefs of outstanding universal significance. Learn about the Christian heritage of Jerusalem and its place within Christian pilgrimage. This list of shrines in Jerusalem under the protection of the Greek Orthodox Patriarchate details their location and historical significance to Christianity. Go inside the Church of the Holy Sepulchre in this virtual tour provided by the Catholic Church’s Custodia Terra Sancta. Enter the Tomb of Christ, see the stone of Mt. Calvary, and explore the chapels and mysterious catacombs of Christianity’s holiest site. Learn how a retaining wall–the last remnant of the Second Jewish Temple–went from a neglected ruin to the most iconic symbol of Judaism within the last 150 years. The Temple Mount A Jewish perspective on the importance of the Mt. Moriah as the site of Solomon’s Temple and the Second Temple that was destroyed by the Romans. Includes accounts of many of the historic controversies and conflicts surrounding this sacred site. A Muslim perspective on the importance of the Noble Sanctuary in the history of Islam, emphasizing the distinctions between the Dome of the Rock and al-Aqsa Mosque.